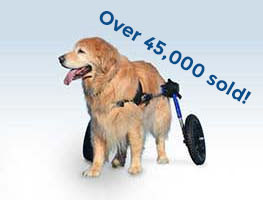 UsedDogWheelchairs.com is part of HandicappedPets.com’s growing family of websites. UsedDogWheelchairs.com provides listings for previously used dog wheelchairs and other pet products related to helping injured or disabled dogs and pets. UsedDogWheelchairs is free to use by the public to post ads for dog wheelchairs and other related pet products. HandicappedPets.com was created in 2001 to support the caretakers of elderly, injured, and handicapped pets. We have all of the products, services, and support you’ll need. The site was created by Mark C. Robinson in memory of Mercedes, a slightly epileptic Keeshond who was put to sleep before her time because Mark didn’t know any better and had no way to find out more. Now there’s a way. Is your dog suffering from paralyzed limbs, an injured back, or other disability? Is it dealing with disabilities that may slow impair his ability to play and exercise? Fortunately, a do wheelchair might do the trick. Quality pet wheelchairs are made to aid dogs that suffer from disabilities, mobility problems, and paralyzed limbs. Because it helps them get exercise, it can support healing. A Dog Wheelchair can bring back your dog’s enthusiasm and mobility towards day to day activities. Dog wheelchairs can also be used by dogs that have just gone through surgery and are on a healing process. They can be used for pets suffering disorders brought about by genetic makeup, arthritis, bone dislocations, bone fractures or sprains. Not only do they help your dog cope, but also helps them enjoy life, playing while actually strengthening muscles and damaged bones. It helps your dog regain his or her sense of freedom and revitalization. Diseases, disorders, paralysis, or accidents that cause your pet dog to limp can reduce muscle tone and limit movement for your dog which may result in reduced mobility. Atrophy is a tendency for muscles to shrink when no longer in use and full-body exercise is a key to healing. Dog wheelchairs will help your best friend run and play, getting the exercise they need. A quality dog wheelchair is made up of a strong metal frame, a soft, comfortable harness and wheels. The frame supports the skeletal structure of the dog. The harness holds him securely and comfortably, and the wheels, with several types and styles available, allow the dog to move freely on all types of terrain. Furthermore, with adjustable wheelchairs, they can be fit so that it supports good posture in the animal. The harness is designed to give the dog a comfortable seat that allows both males and females to eliminate. Optional air and foam tires can be selected based on the terrain the dog will be on; grass, pavement, beach, and trail. Most of all, dogs in wheelchairs are happier. In the past, a dog that could not walk was considered at the end of its life. Now, with these fun and convenient dog wheelchairs your best friend’s mobility is a part of his happy healthy life for years to come. Of those we researched, the Walkin’ Wheels by HandicappedPets.com is by far the best dog wheelchair on the market. It comes fully assembled, adjusts to any size dog, ships same day, and folds flat with a simple release knob so you can take it with you wherever you go.